The Edmonton Oilers informed both Patrick Maroon and Mark Letestu that they would be moved before Monday’s NHL Trade Deadline. Letestu just found out the Oilers are a team of their word. On Sunday, the Oilers traded Letestu to the Nashville Predators for young and speedy forward Pontus Aberg. The Preds then flipped Letestu to the Columbus Blue Jackets for a fourth-round draft pick. Letestu will be heading back to Columbus where he is building his off-season home and the Oilers moved a veteran depth center for a young prospect closer to full-time NHL action than he is a project. The Blue Jackets are still jockeying for a playoff spot in the Eastern Conference and Letestu might help get them there. A right-shot center, Letestu has the ability to win faceoffs, play power play and penalty kill minutes and while he’s not had a great campaign in 2017-18, he’s coming off a record-setting year in 2016-17 where he scored 35 points and helped the Oilers make the playoffs for the first time in over a decade. For Letestu, he couldn’t have hand-picked a team he’d have rather gone to having played in Columbus before signing in Edmonton. In his presser with the media, GM Peter Chiarelli said he wouldn’t be blowing up the Oilers despite their awful season. He did say he’d remodel and part of that remodel including looking for speed and prospects who were NHL ready. Aberg offers that in spades. He is a fast, skilled winger who carries a 650K cap hit through 2019. 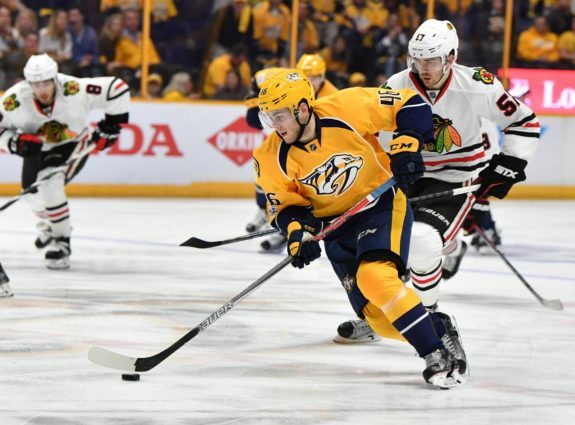 He scored 25 and 31 goals in the AHL with Milwaukee over the last two seasons and comes from an organization in Nashville who require all forwards to be responsible on both sides of the ice. At 24 years old, he’s got a lot of room to grow but is already a player the Oilers can potentially plug into their lineup on the left wing. 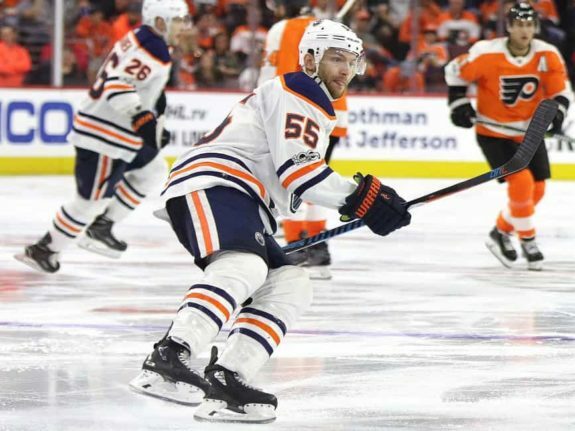 Outside of the obvious, in that Columbus was looking to upgrade their depth center position, Letestu was part of a bigger and fundamental problem for the Oilers this season. While in recent games the penalty kill was better, it was horrendous over the whole of the season, as was the power play. These were two areas Letestu was often deployed. This is not to say that Letestu was exclusively to blame but the situation needed to be handled and moving Letestu for a prospect that could have a strong upside was a wise move on the part of the Oilers. The Oilers had talked with Letestu about re-signing but it appears they believed moving him was the right play at this moment in time. It could be too that Nashville was willing to give up a bit more than expected and then flip Letestu to the Jackets as a way to keep him from joining the Winnipeg Jets. The Jets were also rumored to be interested in the Oilers former center and the trade deadline isn’t just about improving your own team but ensuring other teams who you might face in the postseason don’t improve. So far, while fans lament the season and summer that saw the Oilers now in the bottom tier of NHL teams, some are starting to admit Chiarelli has had a good trade deadline. He still has one more piece to move in Patrick Maroon who was held out of Saturday’s game against the Kings. The hope is that a team is willing to part with a first-round draft choice for him, although a second seems more likely.